The tutorial for Kotlin: 16K+ words to show everything you need to start using Kotlin. Download the PDF version to read it at your leisure. Productivity that stems from experience. For example, you can now create a POJO with getters, setters, equals(), hashCode(), toString() and copy() in a single line. Eliminate entire classes of errors. Kotlin is a statically-typed language that protects you from null pointers. You have to declare a variable as nullable, and even then it will stop you if you are doing something dangerous. Develop the way you need. You can use object-oriented programming, but you do not have to. Lone functions and procedural programming are fine. When you are checking if a variable belongs to a certain type, it will auto-cast it to that type. Because it is a smart statically-typed language. It is not just the language, the tools matters too. And Kotlin has you covered. 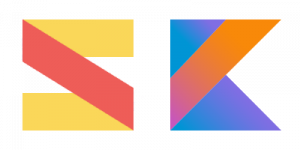 Kotlin is developed by JetBrains, the famous software developer. So you know the tool support is going to be great and your developers are going to be happy and productive. Which makes you happy. But they are not greedy: they also offer free plugins for Android Studio and Eclipse. There is also a standalone compiler to cover any corner case. We are not talking about just IDEs: you can also use Kotlin with Gradle and TeamCity. You do not even know the best part: there is no need to throw away your old code. And it is truly multiplatform. Java famously promised: Write once, run anywhere. Kotlin can do that, too, since it can run on the JVM. And it is 100% interoperable with Java. So you can keep using your old code. Oh, and Google made Kotlin a first-class citizen of Android. But it can also do more than Java. Kotlin can also be compiled to native code, using a LLVM backend. And thus it can go where Java cannot: Apple iOS or embedded systems. And it is not just the web companies that uses it: the enterprise does it, too. Corda is a distributed ledger platform developed by a consortium of 70 of the largest financial institutions of the world. Who are surely not willing to take many risks with their infrastructure. And they use Kotlin for 90% of their code. If you have the expertise, you can now truly apply it everywhere. You do not have neither to hire new developers, nor to use outsourced developers. No more lower quality versions because you lack a developers that know that specific platform. You can learn more and get practical advice by looking at our articles. Or you can look up on the official website or find more resources on Kotlin is Awesome!